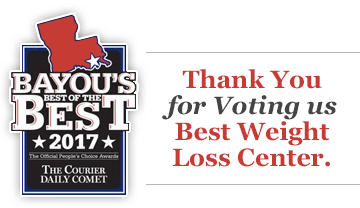 Thank you for choosing Louisiana’s number one weight loss clinic! We look forward to getting you started on our program and in order to speed up the process of your first visit we ask that you fill out the paperwork below. Click here to see what to expect during your first visit at the Aspen Clinic! We know the hardest part of losing weight is getting started and you have just taken the first step on your weight loss journey! We suggest arriving at least 10 minutes early to your initial appointment to begin filling out your paperwork. You should be greeted warmly by our staff members. You will be presented with your paperwork and given proper instructions regarding the paperwork. At this point, you will be instructed to have a seat, as one of our nutritional counselors will be with you shortly. WHAT PROCEDURES SHOULD I EXPECT AT MY INITIAL VISIT? One of our nutritional counselors will assist you into one of our counseling rooms, where she will perform a blood pressure check, appointment setup, patient questionnaire, a body composition analysis, and meal plan set up. All of which will be thoroughly explained to you in detail. Afterward, any paperwork that has not been completed can be finished at this time. You will then attend a Nutritional Orientation, which generally lasts about 30-40 minutes. After the orientation, you will meet privately with our physician. AFTER MY INITIAL VISIT, HOW OFTEN DO I COME BACK? You receive FREE weekly weigh-ins and counseling, of which we highly encourage you to take advantage of. Once a month, you come back to see the physician for a refill on your appetite suppressant medication. DOES YOUR PROGRAM ACCEPT INSURANCE? We do not accept insurance; however, your prescription for your appetite suppressant may be covered by your insurance company. ARE THERE SPECIFIC AGE LIMITS TO YOUR PROGRAM? While we are anxious to help everyone, we can treat patients’ ages 15+ years of age. **Please note, patients under the age of 18 must be accompanied by a parent with signed pediatric consent. WHAT EXACTLY IS THE NUTRITIONAL ORIENTATION ABOUT? Our nutritional orientation will help you understand our program in more detail, as well as in-depth information about lifestyle changes with the aid of the appetite suppressant medication. Learn more information about food journals, exercise, water intake, food labels, metabolism, portion control, the food guide pyramid, and more! We offer a full range of pharmaceutical grade supplements, as well as protein bars, smoothie mixes, cookbooks, food journals, calorie counters, and water bottles. Ask us about our specials and packages we offer on our beneficial products! As a courtesy to all patients, please silence and refrain from using cell phones and pagers while in our office. We accept cash, checks, debit and all major credit cards. Returned checks will be subject to a service charge. WE LOOK FORWARD TO HELPING YOU ALONG YOUR WEIGHT-LOSS JOURNEY!